It’s no secret that cracks in asphalt surfaces allow water to penetrate the surface, softening the stone base and leading to alligator cracking/spider webbing, pot holes and other forms of degradation. Left unfilled, cracks will allow rain and moisture to flow through pavement and erode base materials; resulting in potholes, and ultimately in premature failure. Cracks left over the winter can grow quickly due to snow plowing and the freeze/thaw cycle. In warm and sunny climates, oxidation and humidity have a similar effect. Patching often doesn't last and can cost several times what timely crack-sealing costs. In the end, the useful life of the surface is shortened, forcing the premature and costly replacement of the surface. • Surface/Shrinkage Cracks - Caused by lack of traffic, extreme temperature changes, excess water and/or ultraviolet degradation. • Structural/Reflective Cracks - caused by vertical or horizontal movements of pavement beneath, due to expansion and contraction with temperature and moisture changes. • Joint or seam cracks - caused by weak seam or improper pinch roll. The Federal Highway Administration Manual of Practice (FWHA Report Number FHWS-RD-99-147) states that “crack sealing and filling are imperative preventative maintenance tools.” Once cracks have begun to occur in pavement, the property owner is officially “on the clock” with regards to instituting a crack filling program. The Strategic Highway Research Programs (SHRP) Long Term Pavement Performance (LTPP) studies indicate that instituting a preventative maintenance program including crack-sealing can extend the life of asphalt from 6 to 20 years. As part of a preventative pavement maintenance program, crack sealing can reduce pavement deterioration by restricting water penetration into underlying base and sub-base layers. Crack sealing/filling prior to surface treatments enhances the treatment and further extends the pavement life, and stands out as an economical maintenance technique. The overall success of pavement maintenance systems that include crack sealing, combined with the generally low cost, make crack sealing a desired maintenance program. Crack sealing provides the most cost-effective use of dollars over time compared to other pavement maintenance techniques. 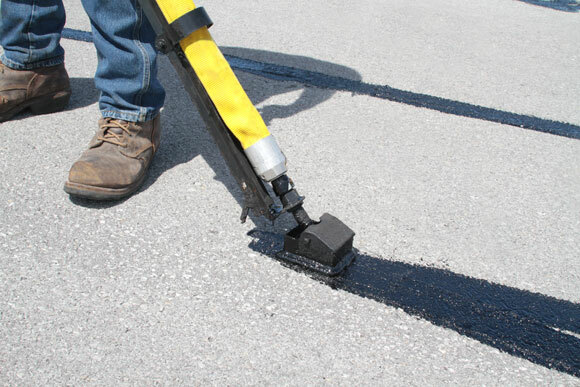 Filling cracks with either a hot or cold rubberized crack filler helps prevent rain and moisture from flowing through the pavement and causing pavement or base/sub-base failure. Dependent upon the amount and severity of the cracking, it will need to be determined whether or not to use a cold pour material (primarily for minimal cracks and available in a variety of packaging options) or hot pour material (for more excessive cracking, and applied using pour pots or direct or indirect fire kettle machines). A thicker, trowel grade material would be necessary alligator or spider web cracking. Performance specifications are written for different movement conditions and pavements, and one specification will not cover all crack sealing situations. Today's sealants are highly engineered products, and are formulated to perform in some of the most difficult climatic conditions. Subsequently, there are a variety of materials available on the market today, with each manufacturer traditionally making available their version of each specification. It is recommended that you speak with a manufacturer's representative to find out how the sealant was designed to perform before you purchase a sealant. To ensure a minimum standard for sealant performance, the American Society of Testing and Materials (ASTM), the American Association of State Highway and Transportation Officials (AASHTO) and federal agencies have developed test specifications for polymer-modified and asphalt rubber sealants. How the material is applied is oftentimes as important as determining what material will be used. Although tar pots/kettles are still used for applying mineral-filled materials, they are prone to pocket, or uneven heating and can burn or destroy crack and joint sealants that utilize polymers or rubbers. Melters eliminate this problem by using a high-temperature heat-transfer medium, such as oil that are highly effective in evenly heating the material. These types of melters are known as "oil jacketed" melters or "double boilers." These materials are commonly applied at 375 degrees F. Hot pour sealants are effectively applied through a delivery hose and wand – with newer models offering a heated hose that keeps material from hardening in the hose, and allows for pumping left over material back into the kettle. To get the best results from a crack filling program, it is important to properly prepare the crack prior to sealing/filling. There are a few common methods used to clean cracks of all debris – usually including vegetation, loose rock, dirt, and dust – prior to filing. A clean, dry surface is imperative to achieve proper adherence of the crack filling material. Some methods of crack cleaning are effective in removing debris from the existing crack. The most common practice of removing moisture and vegetation is the use of an air compressor; or a hot air lance generating temperatures in excess of 2,000 degrees F. You should always use a heat lance when temperatures are below 50°F. It is also common to use a motorized steel wire brush to clean cracks prior to the application of crack sealing material. These methods can be ineffective because the varying widths between the sides of the crack sometimes inhibit the material from filling the entire crack; potentially leaving a void at the base of the crack, and diminishing the hold the material has on the asphalt. The most effective method of crack preparation begins with routing. In this method, a worker follows the crack with a motorized piece of equipment called a router. Using what is referred to as a carbine-tipped flailing star; the router creates a ¾ inch wide by ¾ inch deep reservoir with relatively smooth surfaces. The material can then fill the channel more consistently – allowing for proper adhesion, and gives the material the ability to expand and contract evenly through a variety environmental conditions. Once the rout is complete, and prior to crack filling, it is necessary to use compressed air (hot or cold) to remove the dust created by the router. • Slightly overfilled on the surface. As cited earlier, sealants/crack filler applied in routed cracks performed longer, especially when using a recessed configuration to dispense the material into the routed crack. In an over-band configuration, the sealant is placed onto and over an un-routed crack and smoothed down with a crack sealing shoe or disc. Finally, the sealant can be shaped into a band over the crack using a rubber blade squeegee or a sealing shoe that flattens the sealant over the crack. Regardless of how it gets done, crack sealing/filling of asphalt pavement – driveways, parking lots and roads – is necessary structurally, and can yield long-term financial savings. This article was written by Greg Walters of Sealmaster - Manufacturer of high quality asphalt maintenance materials and equipment.